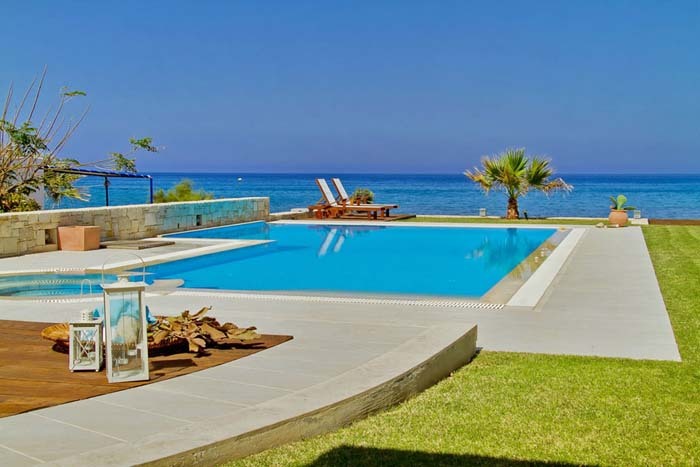 A luxurious villa, large garden leading down to the beach. Pool, garden shaded area, BBQ area with outdoor and indoor eating area; complete with bread/pizza oven! The pool and garden was serviced once per week and the maid visited twice per week to clean etc. All bedding, beach towels, etc, etc were of the highest quality. The beach was a bit rocky but plenty of sandy areas within a minutes walk. Shops within 10 min walk or 2 in the car! Hersonissos town 5 to 10 minutes by car, or 20/30 minutes walk many restaurants, bars, shops in town. There are other hotels/resorts nearby. Once or twice the late evening music was a little loud.